Today’s Parkton dental article is entitled ‘Oral Health For Parkton Diabetics.’ Many Parkton people with diabetes have dental problems. However, gum disease, tooth loss, and periodontal disease are avoidable. Blood sugar is the complicating factor. Parkton diabetics who control their blood sugar have lower rates of dental problems. In fact, many Parkton dentists have noticed no increased risk of dental disease among diabetics who maintain healthy blood sugar levels. When blood sugar levels rise, the levels of sugars and starches increase in your mouth. These substances combine with the bacteria naturally present to create enamel-eroding plaque. Untreated plaque creates cavities. In addition to cavities, Parkton dental patients with diabetes need to be vigilant about gum health. Because diabetes can make it harder to control the growth of bacteria, the amount of plaque in your mouth can multiply quicker. Plaque not only causes cavities, but also inflames and weakens gum tissue and eventually the bone surrounding teeth. Untreated gum disease progresses to periodontitis, a more severe infection. Because Parkton diabetics have a lower resistance to infection, it can be difficult to reverse periodontitis in people with diabetes. To make matters even worse, the presence of infection can make it harder to maintain a healthy blood sugar level. Bottom line? 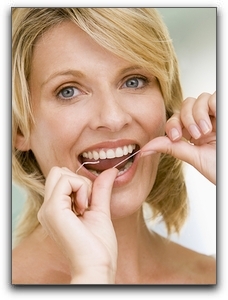 1: Brush and floss regularly to prevent plaque buildup. 2: See your Parkton dentist for twice-yearly cleanings to remove any plaque and tartar that has accumulated under the gumline. Dr. Longenecker of Hereford Dental Health is accepting new patients in the Monkton, Sparks Hereford, and White Hall area. We can help diabetic dental patients keep their smiles beautiful. If you are in need of cosmetic dentistry because of diabetes related decay or gum disease, we can restore your beautiful smile with the latest tooth restoration options. Ask us about crowns, dental implants, implant anchored dentures, porcelain veneers, inlays/onlays, and same-day restorations. Hereford Dental Health is located at 16928 York Rd in Monkton. Call us at 443-672-2548 to schedule a consultation. Thanks for visiting the Hereford Dental Health dentistry blog!